Venn diagram word problems are based on union, intersection, complement and difference of two sets. 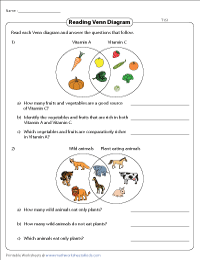 Venn diagram worksheets are illustrated with images, numbers, words and symbols. Few word problems may contain universal set. Use the key information from the given data to solve the word problems. The elements of the set are represented as pictures in these Venn diagrams. Read each Venn diagram and answer the given questions. The elements of the set are multiples, names, days, etc. 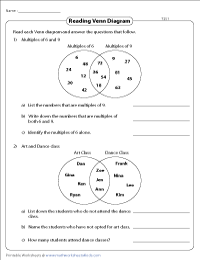 Answer the word problems that follow the Venn diagram on each worksheet. Children should learn to differentiate the overlapping regions and the relation between the sets at the end of the practice. 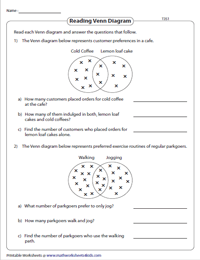 These Venn diagram word problems require the children to count the number of elements in the region. The cross-markings represent the customers in cafes, pizzeria, books in the library, park goers, or members of a gym. Several practice problems on Venn diagram without universal set are given here. Read each Venn diagram carefully and write down the answer. 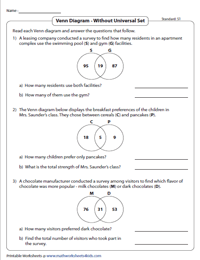 These Venn diagram word problems feature two sets representing the quantities of the data. 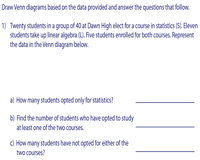 Analyze the regions including universal set to solve these word problems. Follow the direction and create a Venn diagram for the given data. Fill in the key information to complete the Venn diagram. Use all the available information to answer the questions. Draw a Venn diagram with a universal set and fill in each region with the information provided. 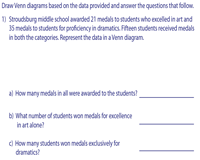 Interpret the Venn diagram and answer the word problems given below.